Continued from Weekend of Darkness, Part One – The Weekend. I won’t write about the one beer I disliked this weekend. Good breweries don’t deserve to have their hard-working, beer-sharing name smeared because someone didn’t like one of their beers. I’ll just say that I could see what they were trying to do with it, but in my humble opinion, they missed the mark, and what could have been great, wasn’t. As for the eleven I enjoyed, I’ll give some minor notes (in no particular order). I don’t have a very advanced palate, so I’ll just do what I can. To my nose, there was sweet sticky vanilla extract. To my mouth, smoked almonds. A delightful experience. The aroma was rich with figs—I felt like I was in Turkey. The flavour didn’t carry quite as much as the aroma promised, but it did have some bitter coffee in the fadeout. The dark brown head already hinted that there was going to be a lot in this drink, and there was. I don’t know if ‘woody chocolate’ is a thing, but after this beer, I hope it is, because that’s what I was tasting, and it was good. Sweet brown sugar hung around for a bit, but then it trailed off into bitter cocoa, with the wood turning to glowing embers in my chest. This was much sweeter and lighter than I expected—almost like a stout with some butterscotch schnapps added. When I was 18, a friend of mine infused a bottle of vodka with Redskins, and it tasted like Redskins with a hint of vodka. This was similar—Redskins with a hint of stout. I could understand someone being disappointed if they were expecting a heavy stout taste, but great if you were looking for Redskins. Also great if you wanted to drink a beer and feel like a kid at the same time. It was light-hearted, and didn’t take itself too seriously. There wasn’t a whole lot of depth to this (I suppose that wasn’t helped by drinking this after some of the other, bigger flavours), but it was a smooth, pleasant sip. Went down easily. I only had a sip of this one, and while there was nothing negative about it, it also didn’t win my heart. See Weekend of Darkness Part Three for more on my expectations of barrel-aged beers. Warm and sweet, with dark fruits—plum and fig, perhaps? My overall impression of this was like drinking a sticky dessert wine, or a port. Take a deep sip of port, dwell on the sweetness on the tongue, enjoy the warmth down the throat, and you’ll have some idea of the Ramjet experience. Little spicy, little peppery, little bitter. I was expecting this mullet stout to be to stout as mulled wine is to red wine, which it wasn’t quite. But enjoyable. I felt like a pirate drinking this beer, heading below deck and trying to get cozy on a winter’s night with a half-a-bottle of dark rum. This was all silk and sultanas. I feel that I probably did some of these drinks an injustice—when you have a fairly barbaric palate and you taste ten dark beers in a relatively short period of time, you surely miss a lot of the subtleties. 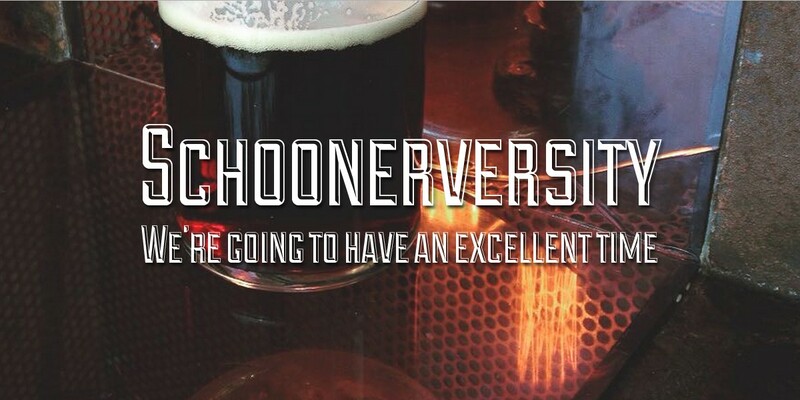 But what can I say—that’s why I’m at Schoonerversity! Stay tuned for the final installation: Weekend of Darkness, Part Three – The Beers I Loved.